Approximately 6,000 people visited the national skilled trades and technology competition at Edmonton’s EXPO Centre this week, including industry celebrities. EDMONTON, Alberta, June 6, 2018 – Today, Skills / Compétences Canada released the final medal results of the 2018 Skills Canada National Competition (SCNC). Over the past week, 550 of the most talented students and apprentices from across the country were tried, tested and judged while competing at the Edmonton EXPO Centre. The complete list of medalists is available on the Skills Canada Website. Over 200 medals were awarded to the top industry champions in six skilled trade and technology sectors, including: transportation, construction, manufacturing and engineering, information technology, service and employment. The competitors were evaluated based on strict industry standards. During SCNC, approximately 6,000 student visitors, industry leaders and several industry celebrities were in attendance to take part in some of the onsite activities such as the Essential Skills Stage and the over 50 Try-A-Trade® and Technology activities. Celebrities included HGTV’s Sherry Holmes, Paul Lafrance and Kate Campbell, as well as Mandy Rennehan, Blue Collar CEO™ & Founder of Freshco.ca. Peter Schiefke, Parliamentary Secretary to the Prime Minister – Youth, also toured the event. The purpose of SCNC is to engage Canadian youth and promote all of the exciting careers that are available to them in the skilled trades and technologies. It is the only national multi-trade and technology event of its kind for young students and apprentices in the country. “Having technologically driven skills and digital literacy skills is becoming increasingly important for careers in these sectors, and through SCNC we are able to raise awareness of these evolving occupations”, said Shaun Thorson, Chief Executive Officer of Skills/Compétences Canada. SCNC 2018 also represents a qualifying year where the two highest-ranking age eligible competitors in 28 identified Skill Areas at SCNC are selected to take part in the next stage of the WorldSkills Team Canada Selection Process. The winners from this WorldSkills Team Canada Selection Event are named to WorldSkills Team Canada 2019 and will represent Canada at WorldSkills Kazan 2019. 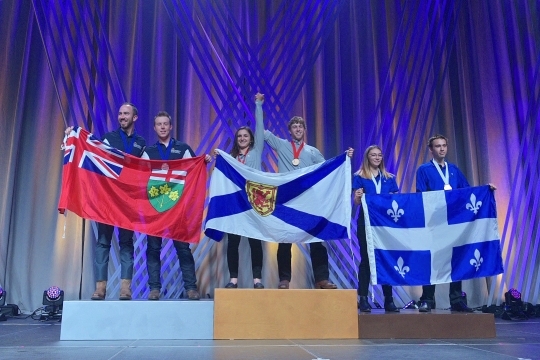 The 2019 Skills Canada National Competition will be held at the Halifax Exhibition Centre, in Halifax, Nova Scotia, May 28 – 29. Skills/Compétences Canada was founded in 1989 as a national, not‐for‐profit organization that works with employers, educators, labour groups and governments to promote skilled trades and technology careers among Canadian youth. www.skillscanada.com. For more information about SCNC visit: https://www.skillscompetencescanada.com/en/skills-canada-national-competition/scnc-edmonton-2018/. Follow Skills/Compétences Canada on Twitter (follow hashtag #SCNC2018), Facebook, YouTube and Instagram. View the Skills Canada Flickr page to access and upload hundreds of high resolution pictures of competitors in action. View the highlights video of SCNC 2018. MEDIA CONTACT : Michèle Rogerson, micheler@skillscanada.com, 613-266-4771.